Despite coming in four different colors the Rainbow Stripe Bowls Set only had three bowls, as it was sold without the Yellow Stripe Bowl. 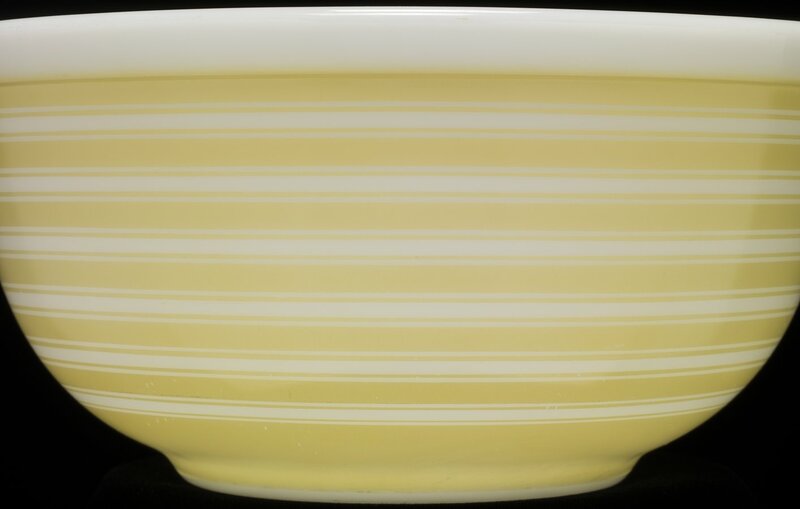 The Yellow Stripe Bowl could only be purchased separately and not as part of the Set. Each of the four colors could also be purchased individually allowing for customers to create their own sets. “New Pyrex Brand Rainbow Stripe Bowls. Gaily decorated…!” proclaimed a 1965 dealer catalog. The popular Rainbow Stripe Bowls were initially released in the 300-series Mixing Bowl Set or sold individually by color. The set included the 1 ½ pint bowl (401) in Pink Stripes, the 1 ½ quart bowl (402) in Sandalwood Stripes and the 2 ½ quart bowl (403) in Blue Stripes. The set did not include the 4-quart (404) Mixing Bowl. The Yellow Stripes Mixing Bowl was not a part of the set and could only be purchased individually. Yellow Stripes came in the 1 ½ pint Mixing Bowl (401), the 1 ½ quart Mixing Bowl (402) and the 2 ½ quart Mixing Bowl (403). Each of the colors in the set, Blue, Pink and Sandalwood were also available in the same sizes as the Yellow Stripes Bowls, allowing for people to purchase a complete set in whatever color combination they chose, totaling 64 different set options. In 1965 the 401 bowl retailed for $.79, the 402 bowl for $.89 and the 403 bowl for $1.29. The three-bowl set retailed for $2.95. All four bowls were discontinued in 1967.